Cancellation must be made 2 days prior or no refund will be given. We are an Australian owned party hostel. We have a 24hr bar, 8 happy hours a day, 50mb Fiber Optic Internet Connection! 2nd fastest in Colombia, on-site restaurant and get lost in the mystery of our huge house which was supposedly once owned by the cartel before they packed up shop. We have transformed this huge house into an amazing hostel experience for everyone. If you ask nicely to the staff, they might show you some of the hidden secrets (escape tunnels, hidden safes, underground whisky storage cellar) this hostel has to offer! We pride ourselves in the service we provide to each and every person who walks through our doors. Being perfectly placed for easy access to the city centre, PARQUE TAYRONA, THE LOST CITY, DIVING, TAGANGA, PALOMINO, MINCA AND MUCH MORE. As well as nearby supermarkets and ATMs. We offer FREE luggage storage so you can explore the beautiful surroundings with peace of mind knowing your belongings are safe and secure. 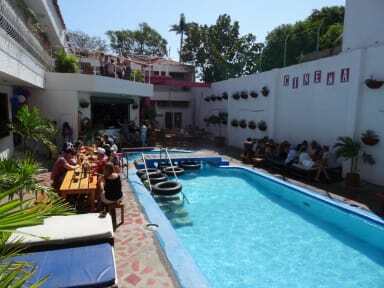 The hostel is extremely spacious with a 24hr bar, on-site restaurant, massive TV/chill-out/games room (pool table, ping pong), 2 pool partys a week, gardens, lots of hammocks and a giant pool. Not to mention the most comfortable and clean beds in Santa Marta. Come join us for a cocktail by the pool or indulge in a perfectly cooked eggs benedicts or pancakes from our all day restaurant menu (vegetarian options available) which is open from 7am - 2am. Poolside massages and cocktails also available. The Adrenaline Addict boys are right next door to us offering super cheap motorbike hire and crazy tours around the beautiful Caribbean Coast.....Fancy a ride through the jungle? or what about the desert......Addreanline Addicts have you covered! 19% IVA will be charged to Colombians upon check-in. Guests can utilize all our facilities before and after staying with us.